If wounded, do not apply bandages. Apply bacon. Use bacon for base jumping. Weave a lovely blanket out of bacon and snuggle up to your loved one on those cold and baconless nights. This will shrink your stomach and hinder your ability to eat bacon. Do not chew gum, chew bacon. In the event of a grizzly bear attack, throw bacon to distract the bear and make your getaway. If your bacon is too precious to throw to a bear, eat it quickly to enjoy a last meal as you are being slaughtered. Attach bacon to your hard drive. Every time you download a large file, the smell will be glorious. In the event of a nuclear holocaust, place bacon near a window so it can cook. Use bacon grease instead of shampoo and give your hair a delightful sheen that will be the talk of the town. Play the "Silence of the Lambs" game with friends and family. If defeated in war, use bacon to feign death. This clever disguise will help you evade enemy capture. Lubricate your body with bacon grease in order to be more aerodynamic. This is useful when traveling at high speeds or competing in a slippery wrestling match. Introducing the How to use Bacon to make your life incredible and amazing series. A series dedicated to improving your already amazing life with the only thing we know, Bacon! Disclaimer: Bacon is meant to make your life better NOT longer. Quality over Quantity. NOTE: this series is not original to A Little Bacon. See the original over at KontraBand. I nominate McDonalds for the innovative Bacon drink of the day. 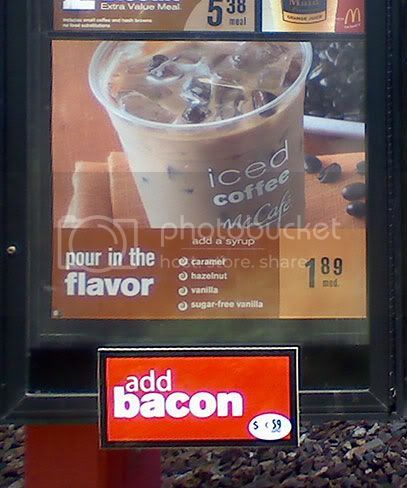 They have recently included the option to add bacon to your iced coffee for only $0.59! I can only imagine how long it will take the other fast food joints to follow suit. Well played McDonalds... Well played. Pro Tip: It's not on the menu, but they'll add twice the Bacon for $1. Thanks to @BrionS for sharing. Bacon Gumballs... A new bubblegum sensation that would make Violet Beauregarde proud. Don't you hate when you eat bacon and then after you're done you just have to eat more and more to get that great bacon flavor... No... Me neither... But if you are watching your waistline, then chewing Bacon Gumballs will help you get the awesome taste of bacon without breaking your diet. PRO TIP: You can mimic that great bacon sizzle by chewing this gum along with some Pop Rocks.